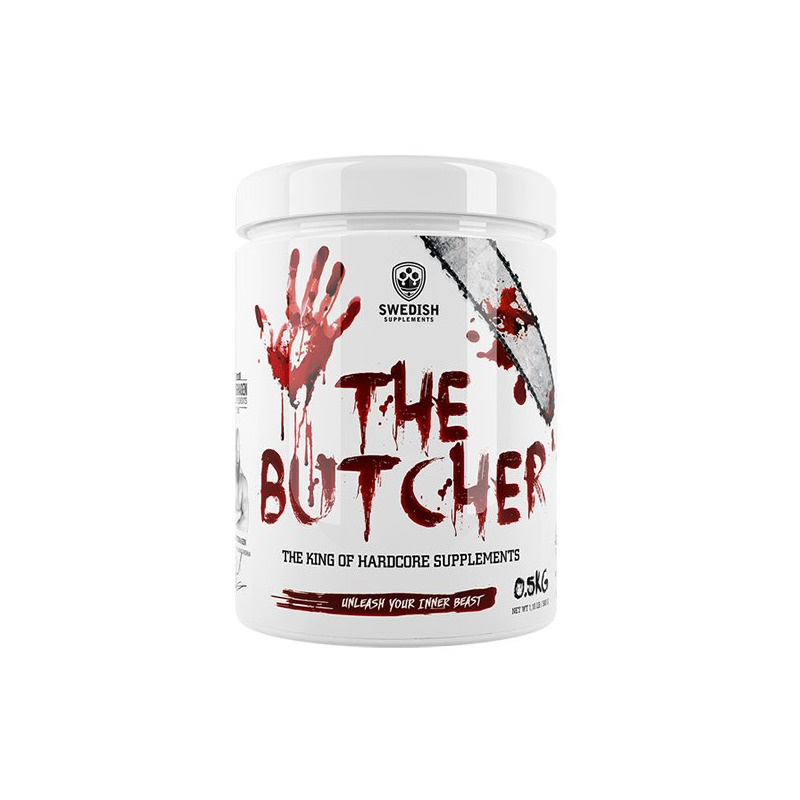 If your goal is to feel maximum psyched to crush the weights in the gym, then The Butcher is something for you. It’s time to slaughter the tiredness and bring out the beast in you. Recommended by Daniel Atterhagen, exercise profile known from Swedish TV. Swedish Supplements have during a long time been collecting scientific knowledge of the ingredients intermutual impacts and how to create products with real noticeable effects as well as how the biochemical mechanisms should be fully utilized. After years of development, The Butcher is finally here. Significantly dosed Pre-Workout product with popular ingredients in carefully calculated composition to give you that little extra that can elevate your performance in the gym. 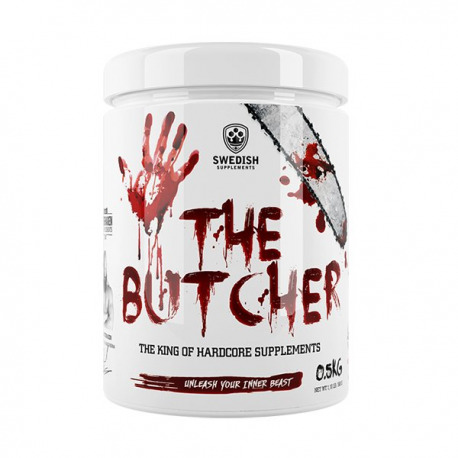 The mix of L-citrulline, L-AAKG, buffering salts, creatine and beta-alanine gives a greatly increased blood flow to the muscle, a powerful pump, an increased explosiveness and lactic acid resistance. Caffeine herbal extracts and amino acids contribute to a razor sharpness and focus through the workout without any sense of a crash afterwards. The significant energy boost comes from the synergy between caffeine, Glucorolactone and amino acids Taurine and Tyrosine and the strongly vasodilating effect that quickly fills the bloodstream with energy and the muscles with oxygen. Beta-alanine, arginine alpha-ketoglutarate, Citrulline malate, creatine monohydrate, Tricreatine malate, sodium citrate, arginine HCL, Tyrosine, Calcium Phosphate, Magnesium bisglycinate, Taurine, Ascorbic Acid, Caffeine, Amaranthus Cruentus, Nelumbo nucifera, Glukorolakton, potassium chloride, nicotinic acid, flavorings , coloring: E-120, sweetener: Aspartame *, Acesulfame-K.